True freedom from acne - mind, body and spirit. You obsessively try to control everything with an iron grip - your food, your diet, your skin care routine - to ensure it doesn't come back. Yet this is incredibly stressful and definitely not fun. You feel trapped in his house of fear you've built yourself. You know the fear is limiting your life (almost as bad as the acne itself) but you just don't know what to do. If the above sounds like you, you're definitely not alone. It's a trap that many of us fall into ... ie. after we are clear or mostly clear, we still can't seem to enjoy our lives because we're so terrified that the acne that we worked so hard to get rid of might come back. I spent three years after I got rid of my severe acne in a cycle of fear just like this. The severe acne was the most emotionally painful thing I had ever experienced and feeling like that again was the most horrifying thing I could imagine. So I was very obsessive.... especially about my food, in order to try and make sure it never came back. But as a result, I felt really limited. Like I could never really be truly free as long as acne was still a part of my life, haunting me like this. I was afraid that I'd never be able to travel again (a great passion of mine) or eat at restaurants with friends without worrying about my food. Because every time I had a minor breakout, or if I ate something unhealthy, it would send me into a tailspin of fear, loathing, and anxiety. I hated that. In fact, it killed me a little bit inside knowing that acne was still ruining my life, even after I had gotten rid of it. Would I really ever be able to truly remove acne from my identity? Have it be something that was truly no longer part of my life? You know... the way healthy, clear people live. They live a healthy life, but they don't obsess about their food or spend hours in front of the mirror, or go to pieces if they miss a day of washing their face. They just live their life, doing things they love. If they get a pimple, they just get on with life. Acne isn't even a part of their world. I wondered if it was possible for me - someone who was so emotionally scarred by my experience with acne - to ever get to a place where acne wasn't even a thing. Where I could get a pimple and not care. Where I could live a healthy lifestyle, but not freak out if I had one unhealthy meal. Where acne wasn't constantly on my mind. I hoped it was possible, but I didn't know. Well I am SUPER excited to tell you that I cracked the nut. Acne is GONE from my life. If I get a pimple now, I don't care. It doesn't bother me AT ALL. I just shrug and get on with it. No anxiety! I hardly ever think about my skin. I spend almost no time thinking about it or looking at it in the mirror. Struggling with this post-acne fear was almost as bad as dealing with acne itself. It limited me just as much, but in a different way. And with freedom being a high value of mine, I wasn't content with just letting this control my life. 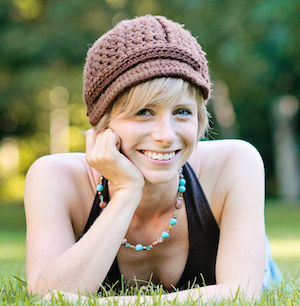 In it, I share with you all the secrets that allowed me to move into my new identity as a truly clear person - in mind, body, and spirit - and how you can too. This was a long, frustrating journey for me to figure out what worked, which is why I want you to give my exact system and shortcuts so you can fast track it. 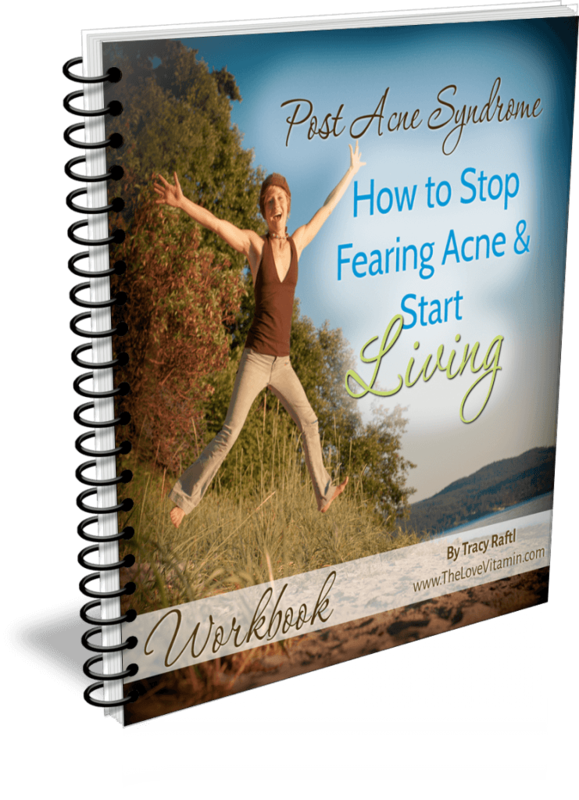 The audio series in the main part of the program, where I let you know exactly how you can go from scared and full of anxiety about acne coming back, to feeling like acne isn't even a part of your world. Complete freedom, in only 3 easy steps (with one bonus step!). Each audio runs for approximately 20 minutes. Get the most out of this program by going through the workbook and doing the provided journalling exercises that accompany the audio. After all, results come from taking action, not just from listening to something! Prefer reading over listening? Or just want a transcript to refer back to easily? Here it is - everything in the audio typed up into a nice 40 page ebook. Finally... you'll be free to live a life where every decision isn't based around your skin. Where anxiety about your skin doesn't exist. Where you never even think about your skin. I know it's been like a dream come true for me, and I want the same for you. The true value of the package is $97, you can get it today for FREE when you join the Naturally Clear Skin Academy. 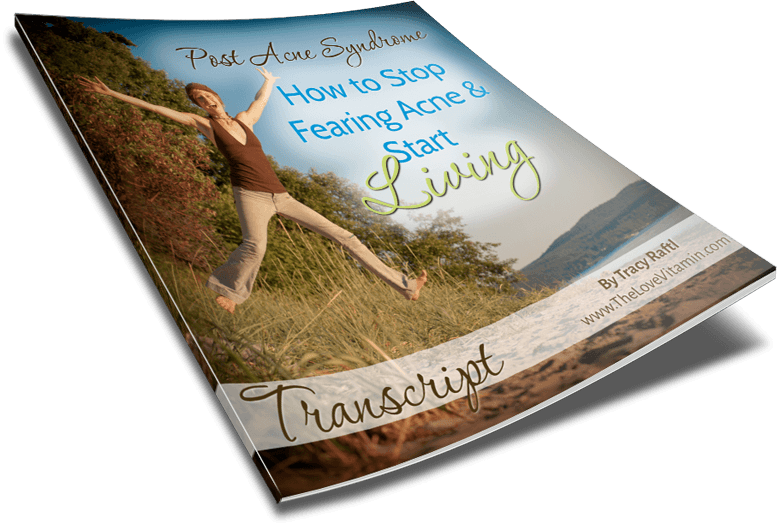 Stop Fearing Acne & Start Living. Begin Right Now.